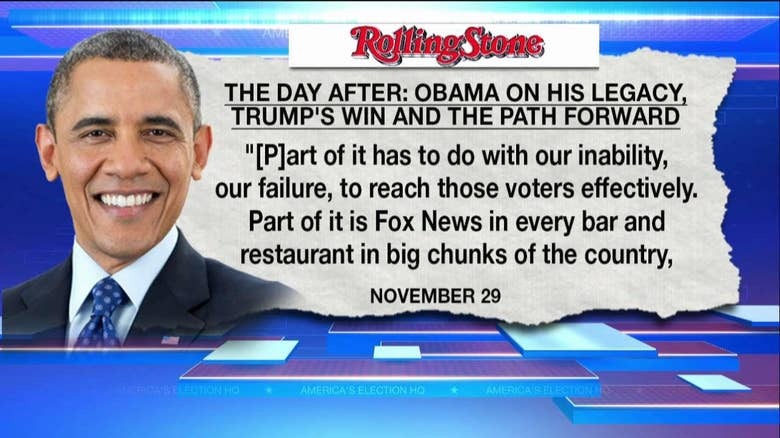 President Barack Obama has lashed out at Fox News at various times during his presidency and it's continuing in the final weeks of his time in office. In an interview with Rolling Stone, Obama was asked if he still believes the U.S. is a "progressive country" following the election of Donald Trump as the 45th president. He pointed to Democrats' failure to reach working-class white voters, as he did in 2008 and 2012. In this election, [they] turned out in huge numbers for Trump. And I think that part of it has to do with our inability, our failure, to reach those voters effectively. Part of it is Fox News in every bar and restaurant in big chunks of the country, but part of it is also Democrats not working at a grassroots level, being in there, showing up, making arguments. That part of the critique of the Democratic Party is accurate. We spend a lot of time focused on international policy and national policy and less time being on the ground. And when we're on the ground, we do well. This is why I won Iowa. It comes after Obama, in a sit-down with Bill Maher before the election, said that "if I watched Fox News, I wouldn’t vote for me either." Reacting this morning on "Fox & Friends," Herman Cain said it's "sad" that Obama doesn't want the American people to know the truth, criticizing the president for repeatedly trying to convince people not to watch Fox News. All times are EST. The time now is 10:54 AM.